Assuming this is not your first time on my site, there are a few things you likely have come to know about me. One, that Paris is one of my favorite places in the world, and le Marais my favorite neighborhood. Two, that I love anything drenched in greenery, especially ivy. Three, that I love luxury (I know, who doesn’t). So when I first discovered Pavillon de la Reine many moons ago I guess you could say it was love at first sight. 2017 has been a bit hectic for me and I found myself sitting in San Francisco for most of August dreaming about sitting at a cafe in Paris instead. 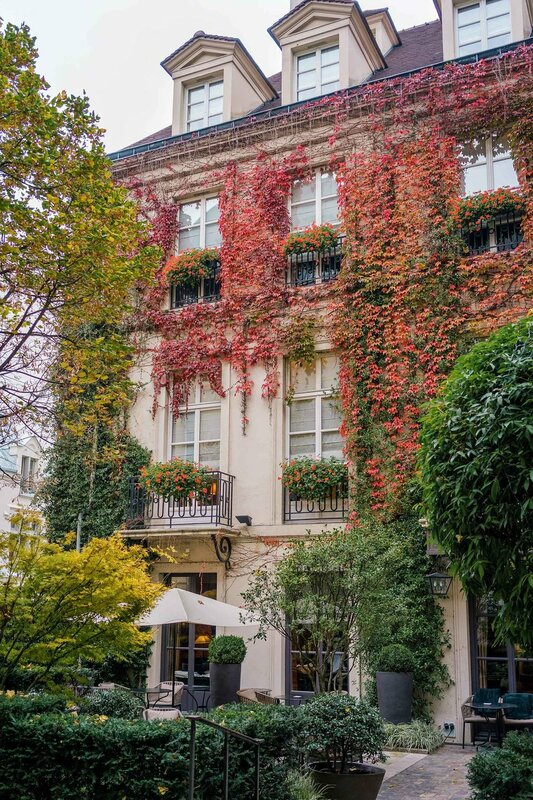 When an October Europe trip started to form I knew I had to stop by Paris and I knew I wanted to stay at the best hotel Le Marais Paris has, which landed me at Pavillon de la Reine. Shortly after confirming my stay there, Conde Nast released their Best Hotels in the World list and guess who was included? Pavillon de la Reine. Long story short, I have honestly never been so excited to stay somewhere in my life. And, no surprise, it did not disappoint! I cannot recommend it enough. The location is perfect, the hotel is to die for, and everyone there is so kind and accommodating. 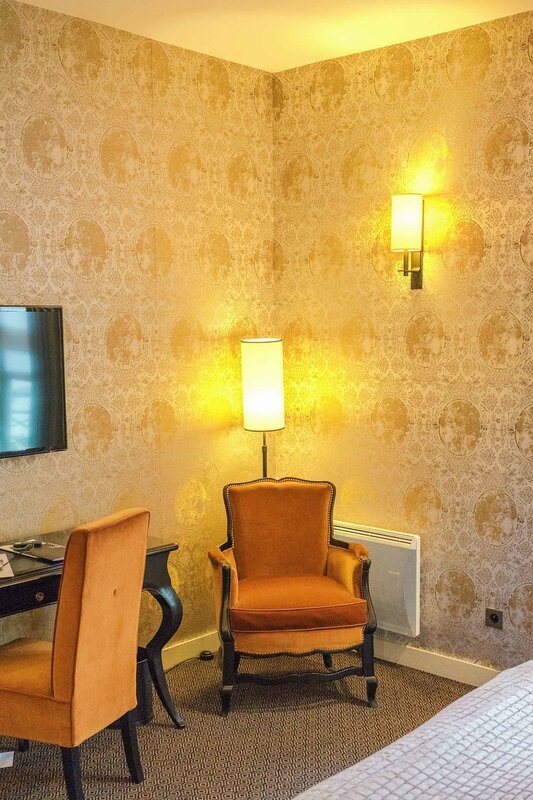 If you have plans to visit Paris, then you should absolutely stay at Pavillon de la Reine, the best hotel Le Marais Paris has to offer! 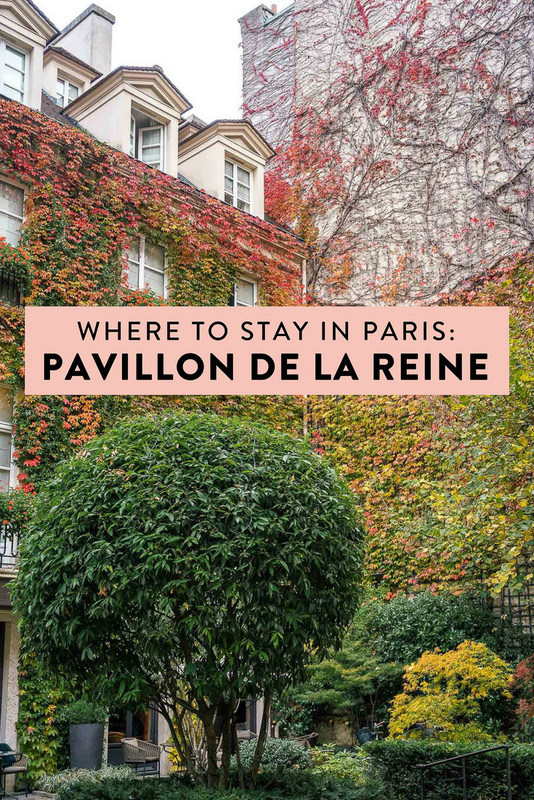 Pavillon de la Reine is a jaw-dropping five-star hotel located in the oldest quartier in the heart of Paris. It is privately owned and ran by the Chevalier family who also own Pavillon des Lettres and Hotel du Petit Moulin. One of the best things about Pavillon de la Reine is its fantastic location. It is located in my favorite neighborhood in all of Paris, le Marais. The Marais is, in my opinion, the most picturesque area, with the best shopping and many of the best restaurants and bars. It is also perfectly located across the 3rd and 4th arrondissements, with quick and easy access to everything you need via the metro. 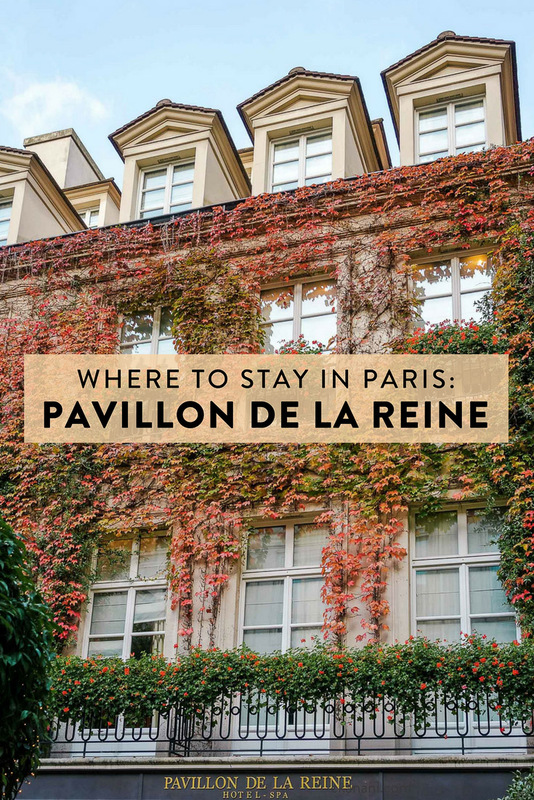 Not only is Pavillon de la Reine located in the Marais, but it is in the heart of the Marais in Place des Vosges. Place des Vosges is the oldest square in Paris, dating back to the 17th century, and is absolutely beautiful. You gain access to the hotel via a private garden courtyard set back from Place des Vosges, making it feel like your own private hideaway. Getting to Pavillon de la Reine from Charles de Gaule International Airport is around a 40 minute drive and from Orly around 25 minutes. 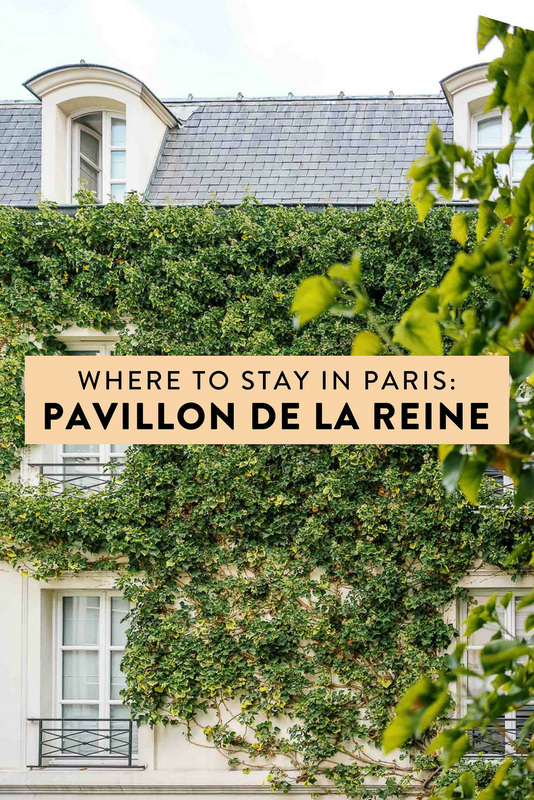 Pavillon de la Reine is a very quick walk away from a handful of metro stations, such as St. Paul, Bastille, and, my personal favorite, Chemin Vert (line 8 takes me basically anywhere I need to go). The beautiful 17th century building, built in 1612 by King Henry IV of France, features 56 individually decorated rooms and suites. 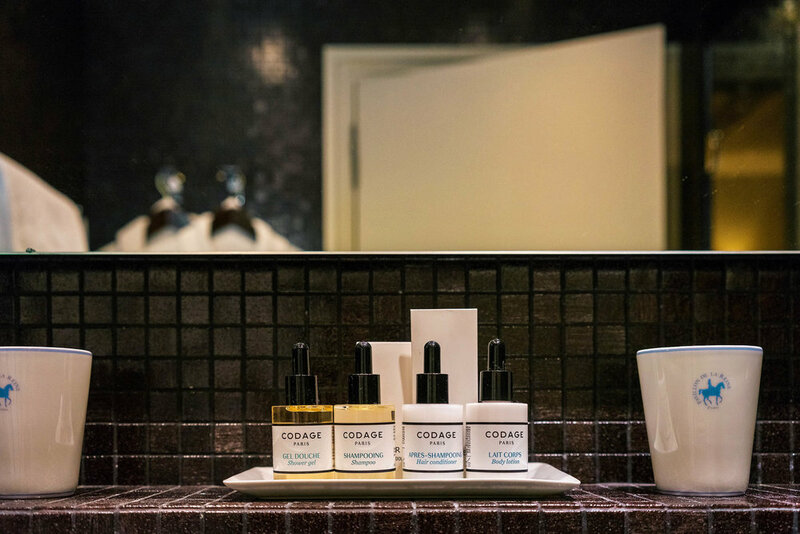 All of the room amenities are up to date and luxurious - I especially loved the beautiful bathroom in mine. There are 8 different types of room offerings, everything from a single or double classic room to the Suite de la Reine (the best suite of all - new as of March). All rooms include plasma screens with satellite TV, complimentary wifi, air conditioning, and more. Breakfast is served every morning from 7 to 11 in the lounge. It includes everything you would expect (eggs, meats, pastries, coffee, etc.) plus the best fruit spread I have honestly ever seen! The lounges are cozy and breakfast there was the perfect way to start my day. In addition to breakfast they also offer 24 hour room service and an honesty bar in the lounge. The honesty bar is a self-serve bar where you pour yourself a drink and sign off on what it is you took. Pretty cool! More info on le Pavillon de la Reine's bar and terrace can be found here. And, as mentioned above, Pavillon de la Reine is surrounded by lively and trendy restaurants and bars so you are always within short walking distance of an excellent meal. 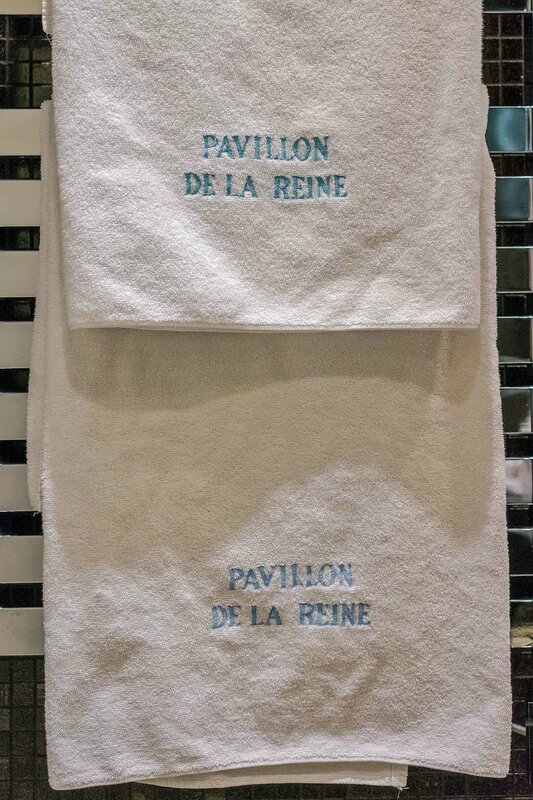 As if all of the above is not enough, Pavillon de la Reine also has a spa. 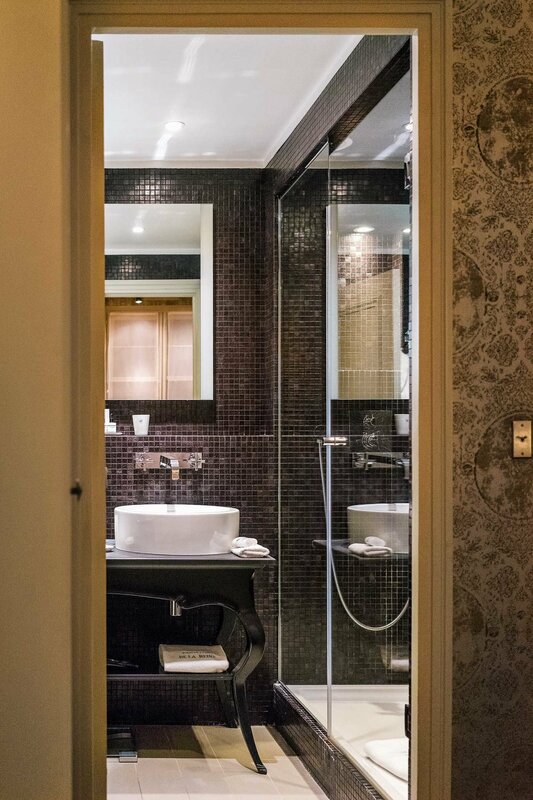 Spa de la Reine includes two treatment rooms, a fitness room, jacuzzi, and steam bath. It is open daily from 7am - 9pm. I unfortunately did not have time to do a treatment but look forward to fitting one in next time! Find more info about the spa here. Rooms at Pavillon de la Reine start at €330 per night for a classic room and go up to €1500 for the ultra luxurious Suite de la Reine. With 8 different types of room options, there is something available for everyone at every price point! Learn more about the different room options here. 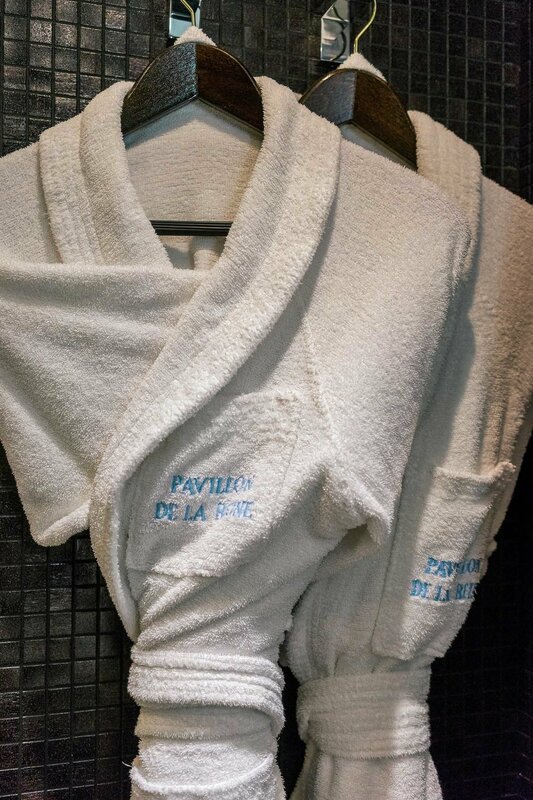 Special thanks to the fabulous Pavillon de la Reine for sponsoring my stay. I already look forward to returning! All of the above is, as always, my own opinion.